Used Cantilever Racking – At Rock Bottom Prices! We searches the country for used cantilever racks for our customers.These include uprights of all heights and arms of all capacities in like new condition. Cantilever racks are a freestanding storage system with horizontal load carrying arms that extend outward from a vertical upright column. These vertical uprights are also called towers by some people. The absence of a vertical support on the ends of the cantilever arms permits uninterrupted storage of long lengths of material. A cantilever rack system comes in all different configurations as well as capacities. Along with the uprights and arms you will also need bracing and bases to complete the rack. The bracing can be set at many different lengths to allow for the flexibility of storing random length material. The bases are actually the components that are attached to the cantilever uprights/towers. These bases set on the floor and have anchor holes in them to allow them to be secured to the concrete. They too come in different sizes depending on the length of your product. A general rule of thumb is that the bases in your rack will be the same length as the cantilever arms. If you need 48” long arms to store your material then you would need 48” long bases to attach to your cantilever uprights/towers. The bases also act a shelf level within the system for additional storage. Cantilever racks are one of the most widely used for storage in warehouses today. 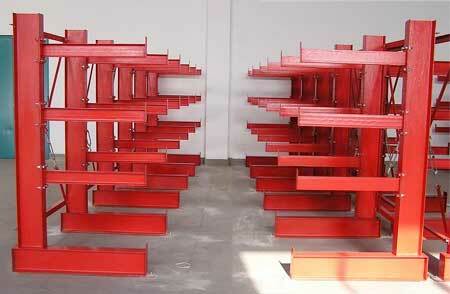 This type of racking system is very simple in design yet can handle large capacities and long loads. Cantilever racks offer many benefits for your business, as they maximize capacity and enable easy loading and unloading. 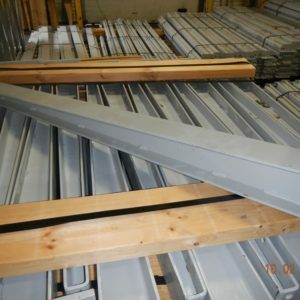 By choosing cantilever racks from you have access to our massive inventory of used cantilever racks. Learn more about how and why you should use cantilever racks for storage in your facility. What is a Cantilever Rack System? A cantilever rack system consists of four major components: uprights (or towers), arms, bases, and braces. While the vertical uprights comprise the main structural piece, the bases support the bottoms of the uprights. The arms extend outward from the uprights and hold product, and the braces support the rack between uprights. Cantilever racks are considered a storage racks that is freestanding in nature, and they are widely used because they do not necessitate vertical supports on the ends of each arm, which enables you to store long products such as tubing, steel bars, lumber, pipe, and other heavy products. Cantilever racks can be found in many different sizes, capacities, and configurations to suit your storage needs. Why Choose Used Cantilever Racks? 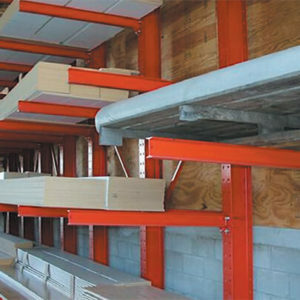 A cantilever racking system is advantageous for many reasons. First, they can store loads that are significantly wider than they are because they do not contain vertical braces. Second, cantilever racks allow you to easily load and unload products from the front of the structure using either a forklift or a pallet jack. This is important for facilities storing long, heavy materials. Cantilever racks also have very high capacities, with each arm supporting about 2,500 pounds. Furthermore, cantilever racks are very fast and easy to assemble. These systems utilize either slot and tag or bolt-on methods of assembly, both of which are simple to put together and take apart. In addition, you can often extend your current system because many styles allow for units to be bolted to one another. Cantilever racks are extremely versatile, allowing for units that are either single or double rack. The double rack system allows you to pick products from both sides, doubling your available space. Finally, these racks are an economical option because they are available used. 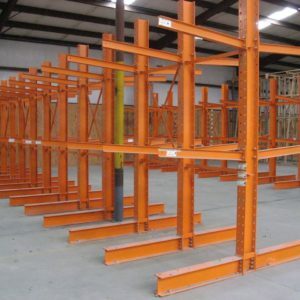 While these racks are recycled, they are still in perfect working condition and are guaranteed to be completely structurally sound. With cantilever racks, you can both save money and preserve the environment through the continuous recycling of these materials.